CONTENTS INCLUDE: Preface: 1. The colloidal state: Introduction; Classification and colloidal systems; Structural characteristics; Preparation and purification of colloidal systems: 2. Kinetic properties: The motion of particles in liquid media; Brownian motion and translational diffusion; The ultracentrifuge; Osmotic pressure; Rotary Brownian motion: 3. Optical properties: Optical and electron microscopy; Light scattering: 4. Liquid-gas and liquid-liquid interfaces; Surface and interfacial tensions; Adsorption and orientation at interfaces; Association colloids-micelle formation; spreading; Monomolecular films: 5. The solid-gas interface: Adsorption of gases and vapours on solids; Composition and structure of solid surfaces: 6. The solid-liquid interface; Contact angles and wetting; Ore flotation; Detergency; Adsorption from solution: 7. Charged interfaces: The electric double layer; Electrokinetic phenomena; Electrokinetic theory: 8. 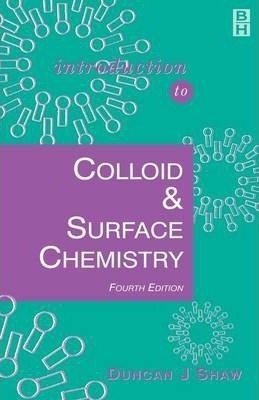 Colloid stability: Lyophobic sols; Systems containing lyophilic material; Stability control: 9. Rheology: Introduction; Viscosity; Non-Newtonian flow; Viscoelasticity: 10. Emulsions and foams: Oil-in-water and water-in-oil emulsions; Foams: Problems; Answers; References; Index.